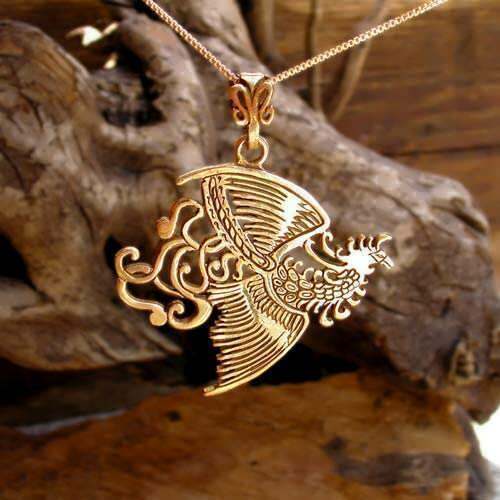 The fire element pendant contains the symbol of the Phoenix. Fire represents the heating factor that burns the past and brings rebirth. In Alchemy, fire is the element of metamorphosis and distillation. Fire represents the third Chakra. The related platonic solid is Tetrahedron and the related zodiacs are Aries, Leo and Sagittarius. This pendant is part of a four pendant set and four rings set called the four elements project. Each pendant represents one of the elements – Earth, Water, Air and Fire. The four elements can be found in different cultures around the world. The four elements represent archetypes on which the whole of reality is built on. The four pendants were created to bring you a tool to enhance your life. Focus on the element that represents the things you are currently looking for in your life. 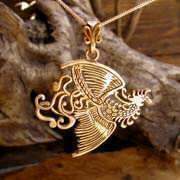 That is the pendant for you. It is possible to select the opposite element from your dominant element and in this way, achieve more balance. The four elements are available as earrings, pendants or rings and both in gold and in silver.